Seaside Postcards have been sent since the advent of the Royal Mail, they’re a greeting from holiday makers through the years. The history of the seaside postcard takes us back to 1894 when the Royal Mail gave publishers permission to make and send postcards through the post. As the century turned and the British public learned how to holiday in their millions, the seaside postcard grew in popularity. It became a tradition to send scenic views back to friends and family at home. 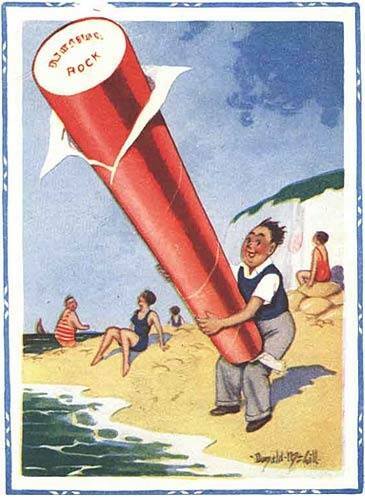 The saucy seaside postcard came along in the 1930’s and quickly became everyone’s favourite message. At the height of their popularity they were selling at a rate of 16 million odd a year. Donald McGill was probably one of the best known saucy postcard artists. You can see the collection at the Donald McGill Museum in Ryde on the Isle of Wight. He created over 12,000 designs throughout his career! The newly elected 1950’s Conservative government were concerned about the content of the saucy seaside postcard, and so the Postcard Censor was born. Dan Robertson is the Curator of Local History & Archaeology at the Royal Pavilion & Museums in Brighton. “I am a student at the University of Chichester and am completing a project on seaside postcards, particularly the saucy postcards of the past. “I wonder if you have any information relating to the Postcard censor linked to the council who would ban postcards regarded as too rude. Apparently the postcard censor in Brighton was busy banning and destroying saucy/lewd postcards by the likes of McGill. There’s reference to 17,989 postcards being seized and destroyed in the town and a bonfire that destroyed 113 of McGill’s postcards in 1953. The student has mentioned a Picture Post article published 29 August 1953 concerning the police confiscating cards from five shops in Brighton. Live Blackpool thought that this was an interesting subject, and we know that lots of you share our interest in local history from the country’s entertainment capital! 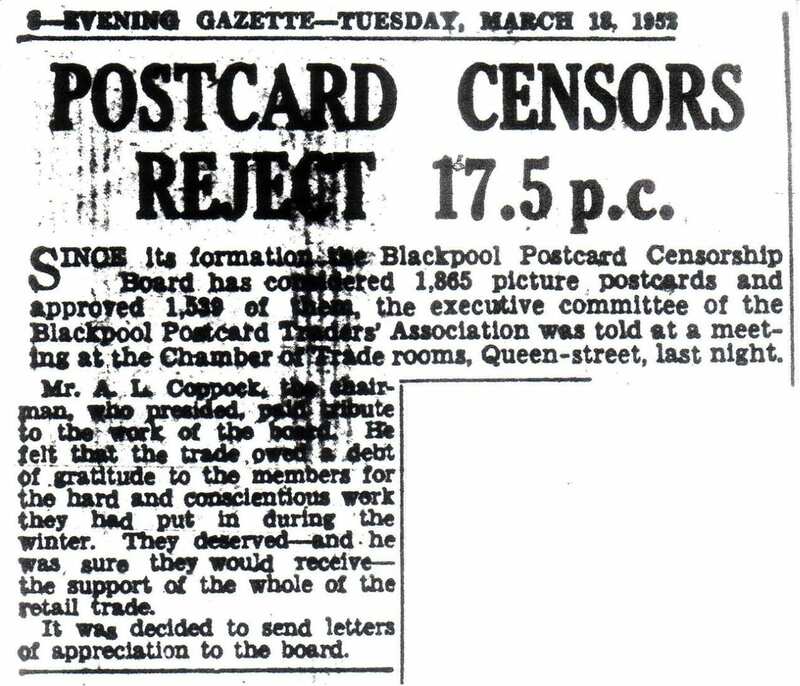 Do you know anything about postcard censorship imposed by Blackpool police/council/shop committees in the 1950s? We asked the question about postcard censhorhip here in Blackpool in the Blackpool’s Past – The Original Facebook group. 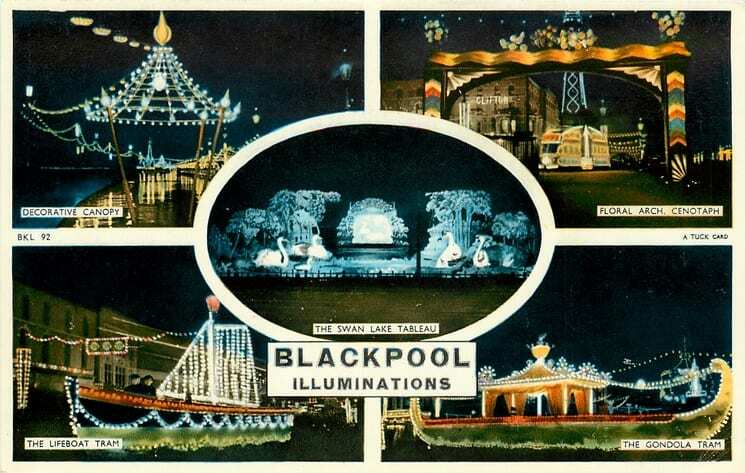 Stella Siddall told us that there’s a collection of old censored Blackpool postcards in the local history library. If anyone fancies popping in, Tony Sharkey was the man to talk to but has since retired. Just ask for any of the heritage assistants who will be able to help you. 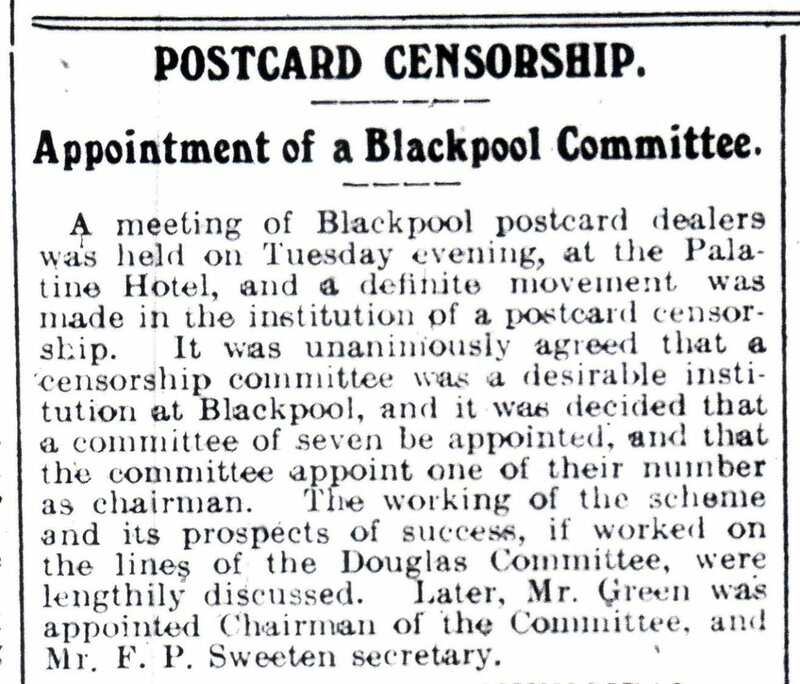 This article from 3 May 1912 (Blackpool Herald) signals the beginning of the censorship committee in Blackpool. As you can see it was actually a trade matter, not established by the Council or authorities. This is the follow up on 12 May 1912 when the members were selected. Although it drops off the bottom of the scan these were: Mr Beswick (tobacconist), Mr Coop (bookseller & stationer), Mr Green (draper), Mr Riley (furniture dealer), Mr Sweeten (bookseller), and Pilling & Whittaker (subpostmasters). What happened after the War (circa 1950) was a renewed campaign against what were seen as lax standards – prosecutions in various parts of the country. Prosecutions increasing – in Nov 1950 the Gazette said “the only solution seems to be a broadminded and experienced panel of censors”. By 1954 there were trade censor bodies in Hastings, Cleethorpes and Brighton as well as Blackpool (IOM committee was official). Make up of the Blackpool 1951 committee was: vicar, landlady, bank manager (retired), solicitor and a stationer. The Blackpool Board was disbanded in 1968. 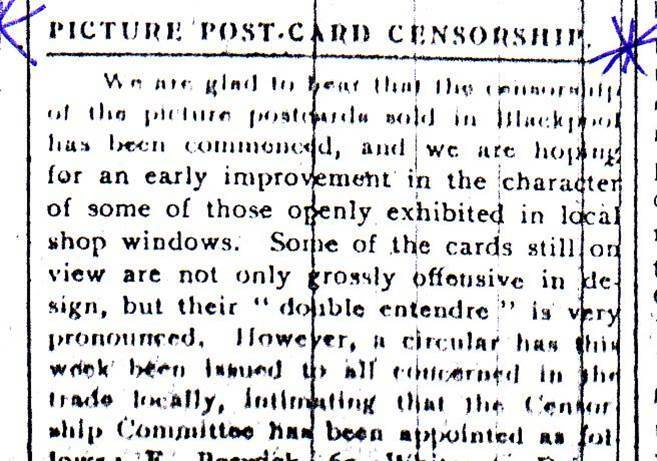 Canon Pritchard (member of Blackpool censorship board 1959-1965) said they reached the end of the road when a shop in Aberystwyth placed notices in their shop window “for sale – postcards banned by the Blackpool Censorship Board”. Robert Allen said that his father was called George Allen and he was in Blackpool in 1952. But he’s 99.9% sure it wasn’t him! 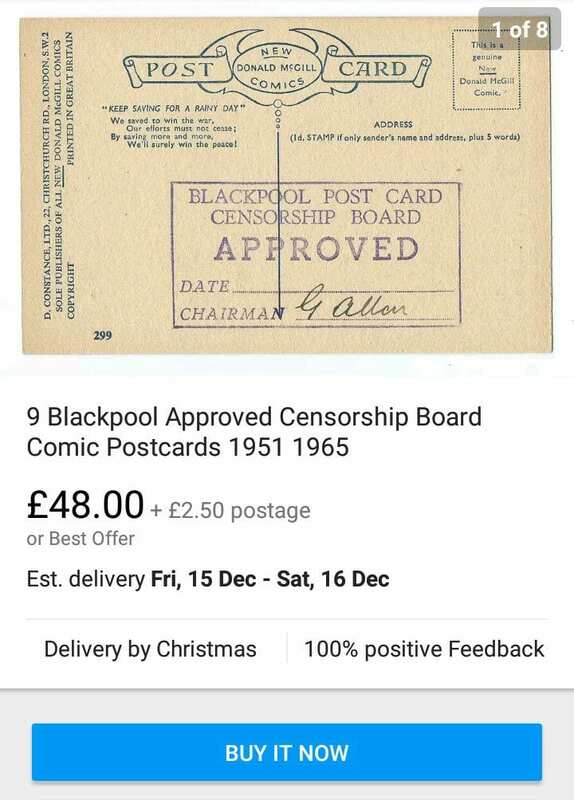 If you fancy adding any to your own collection, censored postcards occasionally turn up on ebay according to Andy Morley, who showed us this lot which was for sale. If you’ve got any information to add please get in touch with us at Live Blackpool/Visit Fylde Coast. We’ll share your information here, and pass it on to Dan Robertson at Brighton Museum.